Today I did manage a fantasy story. 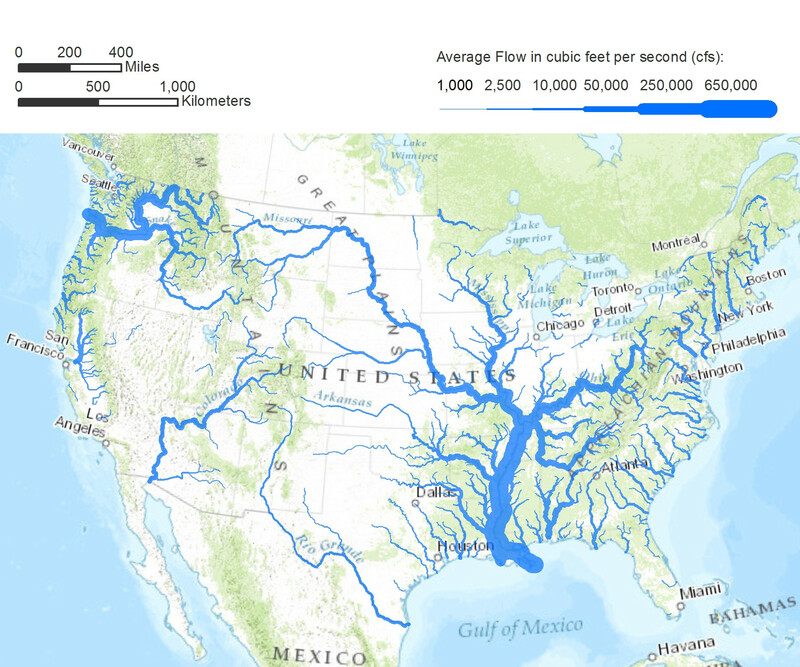 My inspiration was a map someone posted on Reddit’s mapporn subreddit, showing rivers in the USA using line weight as a metric for flow rate; and the Mississippi and its tributaries cover an astoundingly huge area. So that was my kicking off point. We are all part of the great river. I can feel it, when I wade into the waters at the Old Ford, with the waters tugging at my legs and swirling dirt between my toes, I can feel the whole of it, so vast, so many streams and rivers all flowing into one and out into the great ocean. I can’t feel the ocean, and it’s too far away to ever travel to, but I have a sense of it, a sense of something vast and more full of life than the great river or all the lands is draws from and the skies above it. “They’re coming,” I tell the Commander. He is sitting ahorse up on the banks. He doesn’t like the great river, or perhaps he doesn’t trust my magic. Maybe both. Not close, not yet. I envision myself as a fish swimming beneath the shallow hulls of the canoes carrying our allies with the flow. I watch as the paddles dip in the water, propelling the canoes ahead of the current, then vanish to reappear further downstream. I race ahead of them, feeling the flow and the shape of the water, a gentle bend left before the river narrows and carves through rock to the right. “Anything you can do to speed them?” he asks, though he knows my answer already. “The river flows as it flows,” I remind him. His horse snickers and stamps its foot. It’s a sensitive beast, and one which has carried the commander since he was an ensign of seventeen, and it knows his moods. “Right, back inside the fort. Can’t have you out here when the Grey Army comes knocking. We’ll have to hope Captain Roddesh can catch them from behind and they don’t catch her out in the open. I am reluctant to leave the waters. There’s a comfort there; I understand the river, even if I’ve never seen more than a score of miles of it with the eyes in my head. It understands me, or perhaps it is merely aware of me. The fort, though, that stands high above the waters. It casts a shadow over the Old Ford and from its gates march the stone arches that support the new bridge, detached, keeping those crossing high above the waters and out of reach of its pull. Safer, I suppose, and more convenient, but another barrier the new men put up to keep the wonders and vitality of nature at bay, as if they’re scared of where we’ve come from. Still, I follow the Commander back up the winding road to the fort. When the Grey Army comes, those barriers against nature will keep me alive. “Tell your brother to meet me on top of the gatehouse in ten minutes,” the Commander orders, then rides across the courtyard towards the stables. I know where I’ll find Gebb. He’s not actually my brother, but in a fort of New Men, we’re the only two People of Roots, descendant of people who have lived in these lands since the days of ice and giants; the New Men have been here only a few centuries, their arrival told in our newest of history-songs. I don’t like the narrow winding stairs the New Men have in their forts. They’re tight and enclosed and steep, with only narrow little windows letting in light, and they’re made of stone; I like dirt beneath my feet so I can feel the pulse of life, but the New Men like height so they can see far. Gebb doesn’t mind so much about the stairs because he loves the height; if we lived out in the wilds with the other People of Roots, he would climb trees or hike up mountains to be high up. Birds scatter, chirping and cawing, as I reach the summit. Gebb stands upon the wall separating the tower’s top from the open air; the wind cradles him, keeps him from falling as the waters of the great river would keep me from drowning. “Sister of the Waters,” he greets me in his soft, slow voice. “Brother of the Winds,” I reply as tradition dictates. He jumps from the narrow wall and passes me to descend. I linger; for all I hate the New Men’s stone towers, I do like the view from up here. Two paths of the great river meet beneath the fort, one from the plains and the other from the glaciers. Brown silty water mixes with cold blue water, swirling at the seam but remaining separate for more than a mile, and I enjoy the sight of it. Sometimes I sit on the rocks at the fork and dangle my legs in the water, one in each stream. But the blue water is less blue than normal now, muddied to a blue-grey before it meets the water from the plains. I hurry down the spiralling stair and fetch my bow and quiver from my room, then join the Commander and Gebb on the gatehouse. I examine the stone barbs of my arrows – sharper and purer than the iron points the New Men prefer – as we wait. The treeline is a mile the other side of the bridge over the blue waters, and the same distance to the east in the triangle of land between the two paths of the great river. But the blue waters are grey. Not truly grey, but not the icy blue it normally is, though nobody but me would have noticed. “They crossed the blue upstream.” I say it as I realise it. I didn’t sense it because as I stood in the waters they’d already crossed, but only the passage of muddy boots and wheels and hooves could have tainted the blue waters; the deep ford ten miles away would have served them. The Commander reacts quickly, and shouts a series of orders to bring the soldiers on the far end of the bridge back and set more archers on the east wall. Men and women rush around, moving from the clump around the gatehouse to spread out along the east wall. They’re still moving when the Grey Men emerge in a ragged line from beneath the trees to the east. Their line stretches right from the blue waters to the brown, and forward they come. I put an arrow to my bow and stand ready to draw.